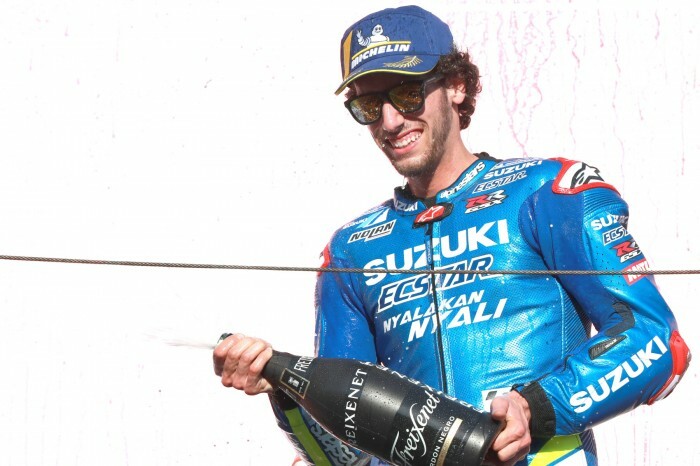 Upgrades from the Suzuki factory helped Alex Rins to his third MotoGP podium of the season in Motegi. The Spaniard benefitted from Andrea Dovizioso sliding out from second place whilst trying to prevent Marc Marquez from winning the World Championship, by moving up from fourth to third place. This marked Rins’ third podium of the season and Rins said that the upgrades brought by his Ecstar Suzuki team have continuously seen his GSX-RR improve. “They are working really hard,” said the 22-year-old. “In Assen we changed the engine and we are using one with a little but more power on the high speed. Since there they are bringing new things, new fairings. Then here we raced with a different one, looks like new winglets. The Spaniard said that earlier battles with Valentino Rossi and his factory Suzuki team-mate Andrea Iannone saw him use a little too much front tyre and meant he was suffering with chatter from the front of his bike. “I’m very happy, since yesterday we knew that our race pace was good for trying to fight for third,” he said. “From the start I overtook many riders and I had good battles with Valentino and Iannone. I destroyed the front tyre there a little bit because then with Cal I had some chattering on the front.